I haven't done a Project Pinterest in a long time but when I came across this cute idea from Adrienne of Our Unexpected Journey for a Holiday Letter wreath I went out and got everything I needed! Just like every good do it yourself project it starts with an overpriced item that makes you go, “I can make that.” So let's get started. I did three different letters including an L that was thought to be too hard but turned out to be my favorite! 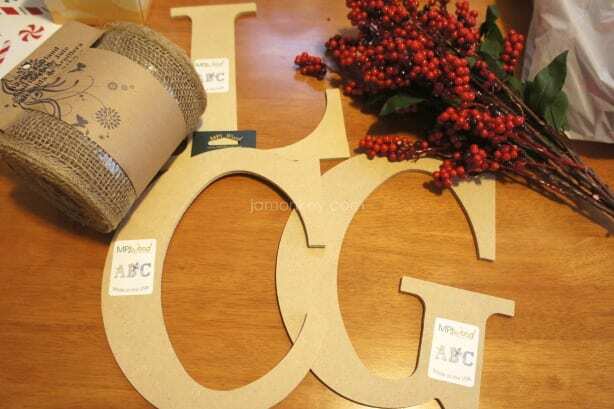 MDF Letters – Black (Michael's had these but were out when I came in so I got mine at Hobby Lobby unpainted) You can find MDF letters with in the Wood section. There are normally a few fonts to choose from. Just select your favorite! 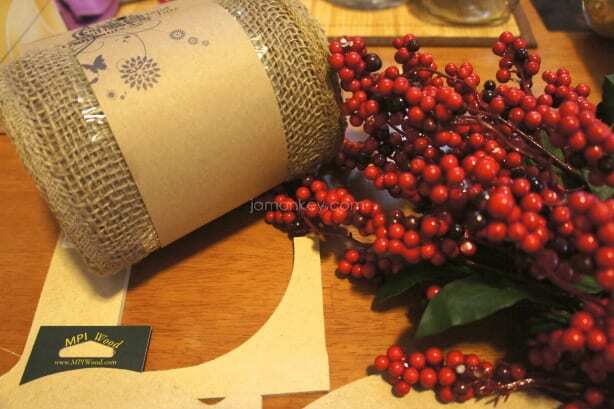 Here is a closer look at the burlap and berries for you! First I painted my letters black so that you couldn't see the basic wood color. After it's all dry cut the berries off the branches in bunches. 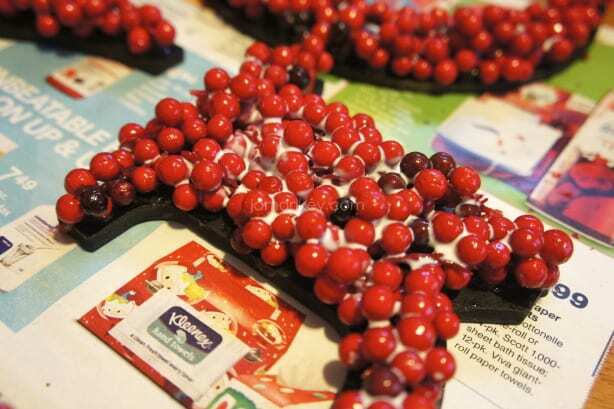 Start hot gluing the berries onto your letter. Make sure to go back and fill in any spaces with stray berries and small bunches. 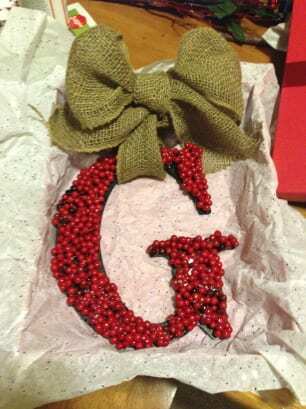 After the berries are dry, it's time to put your burlap bow on. For letters that don't allow for a simple loop through (like my L) you can tie it around the letter itself. I made sure that it was tight and then put the bow higher up. 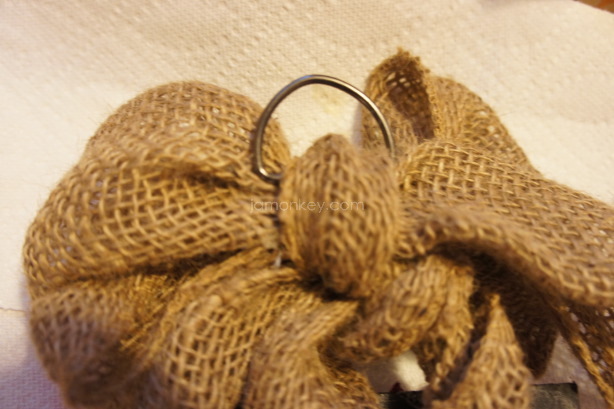 Burlap takes some time to mold and get into a pretty bow but here are two big tips for you. 1. Don't cut until after your bow is made! If you give yourself enough slack you can create your bow to perfection and then cut the end piece off. (Gives you more molding room) 2. Fold it in half first. In my case I had to fold it twice to make it easier. Then after your bow is created you can unfold the bunny ears. Makes for a cleaner knot as well. After the bow was made I hot glued the inside of the knot so it won't ever come untied. 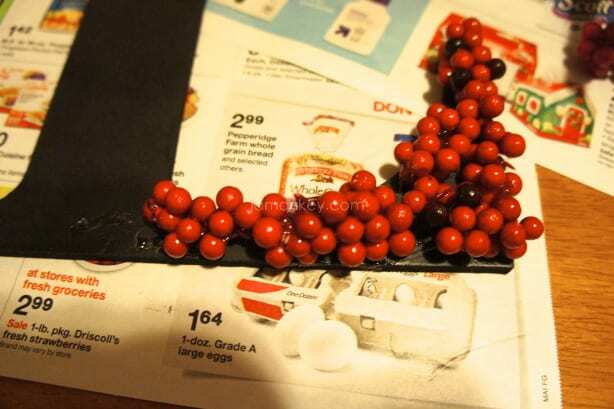 I also put a D-ring through the back of the bow so that it has something sturdy to hang from. 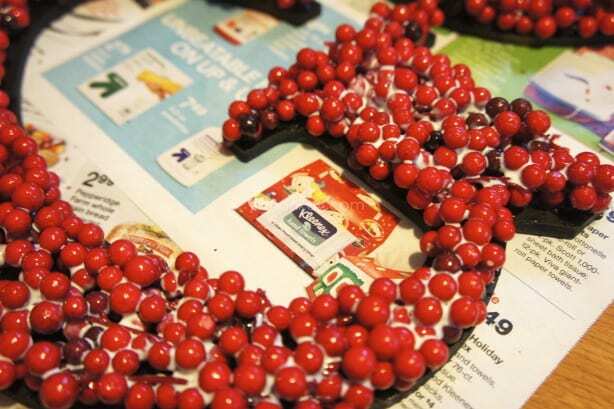 Now your wreath is complete! It's an easy project that didn't take long to do. The longest part was dry times. Use a sturdy gift box for giving that can also be used for storing after the holidays. Target had great gift boxes for only $5. Here are the other two letters I completed. very neat idea! very very pretty too! Those are so cute! They’d definitely make great gifts. That is so cool. I really like this idea. that is very cute. What a nice gift. 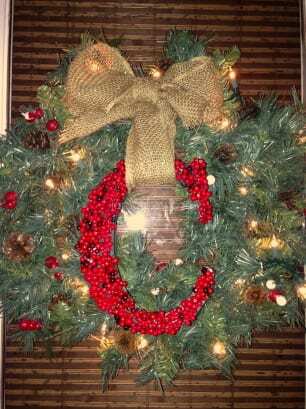 That is a really cute wreath! I love it! This is something that could be used year round, too. What a great idea. I’m going to do this next year! I’m hoping that once my daughter is in college next fall that I’ll have more time to do things like this. We’re so busy with all her school stuff, that I pretty much only getting my blogging and regular household tasks done right now! What a pretty idea for the holidays. I need to pin this so I can dress up the holiday wreath. 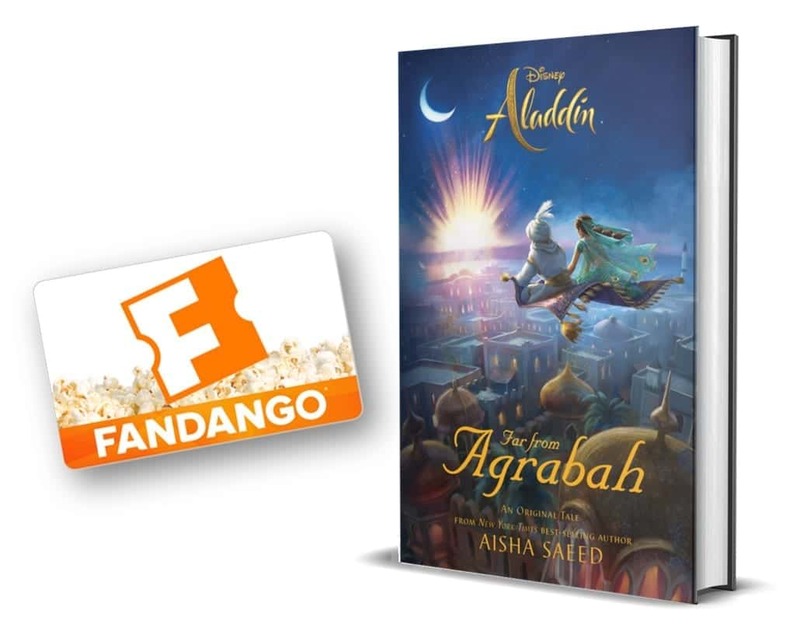 Wow this looks so pretty. I want to make one. Love this idea and thanks for introducing me to project Pinterest I will have to check into this.